(CNN) -- On Thanksgiving, millions of Americans will see the changes a year makes in their family -- how the children have grown, how relatives have aged. Engage the person who has Alzheimer's in conversations even if they don't seem to respond, experts say. Some will encounter elderly relatives who have Alzheimer's disease, a condition that affects 4.5 million Americans. For many, it's an awkward trip where they don't know what to do or say. Facing the changes that accompany the disease can be devastating. As the disease progresses, the essence of a person -- memories and traits -- fades as brain cells deteriorate. Unusual behaviors arise, moods inexplicably vacillate from anger to paranoia, and lapses in people's memories become more apparent. This can cause a person to forget his or her children. It's a prospect Karen McKeever, whose mother has Alzheimer's disease, dreads. "I don't even want to think about that," she said. "I know it's coming.... There are things I don't want to recognize or face." Experts say it's normal to feel sad, abandoned or even angry when a person with Alzheimer's forgets memories and loved ones. Talk about your feelings and keep in mind it's not personal, but the effects of the disease, said Beth Kallmyer, licensed clinical social worker. Thanksgiving is also an opportunity to look for symptoms among older relatives. While there is no cure for Alzheimer's, early detection can improve the quality of life for people affected. Clues include odd or unusual behavior or details of a family tradition that's suddenly absent. About two years ago, McKeever and her four siblings realized their mother, Anne Goins, was repeating the same story to each of them, almost every 20 minutes. On the advice of a friend, McKeever took her mother to a gerontologist. The diagnosis was the early stages of Alzheimer's disease. "To have someone who is so independent, who takes care of herself, who is such a social person, it's hard to see her go through losing her independence. The fact that she forgets, that's the biggest thing I struggle with," McKeever said. Small clues, like mismatched buttons or a house being more of a mess than usual, may be an indication of memory problems, said Eric Hall, the president and CEO of Alzheimer's Foundation of America. "There might be hesitancy and awkwardness or trying to cover up a lack of knowledge or things they've forgotten," he said. "People will spend an enormous amount of energy trying to cover up. You can pick that up in their uneasiness and their language." Keep in mind that memory loss is not always Alzheimer's disease -- it could be issues related to stress or vitamin deficiency, he said. 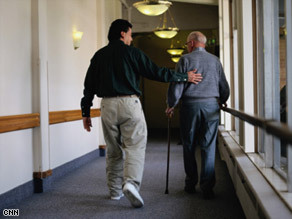 Experts gave advice about interacting with a person in advanced stages of the disease. What if the person who has Alzheimer's disease doesn't remember who I am? Well-meaning friends and family often pepper the patient with the question: "Do you know who I am?" "That's obnoxious -- you want to avoid that," said Kallmyer, director of client services at the Alzheimer's Association. Rather than quizzing someone's memory, she recommends introducing yourself with something like, "I'm John, your son" and other relatives by saying, "Here's my wife, Jane." Be reassuring, hold their hands, and smile and remind them who you are. Rather than trying to figure out what the person remembers, reassure them by calling them by their name, Kallmyer said. The loved one no longer recognizes me. What do I do? After realizing that the person no longer recognizes his or her loved ones, some visitors are at a loss for words or feel apprehensive. Hall recommends having a conversation, even if that person seems unresponsive. "We become uncomfortable doing all the talking," he said. "Continuing to talk to them is an important piece. It's awkward for us, but if we stay engaged, it means a lot to them." Although the patient may not have memory, he or she still has emotions and the ability to pick up vibes and read body language. Use the person's name, maintain eye contact and speak slowly, Hall suggested. Ask one open-ended question at a time, giving adequate time to respond. He calls it the 4S's for communicating: simple, slow, show and smile. "Simple sentences are much appreciated by someone with Alzheimer's," Hall said. "Say it slow to allow enough time to capture words or questions. Show what you're saying, using facial expressions, body language and gesturing. And smile -- it goes a long way." What should I do if he or she keeps asking me the same question? This is common for people with Alzheimer's, Hall said. "The problem is that they cannot remember your response. Instead of answering the question a second or third time, reassure the individual that everything is fine," he said. The patient may not be able to remember or process the answer, so they repeat the same question almost 20 to 40 times a day. "Our first instinct is to answer the question," Hall said. "We're under the assumption that the other person gets it. But in this regard, it's not happening. Instead of becoming frustrated, smile and give an assurance everything is fine and sort of move on." What are some habits to avoid? One misconception is that amplifying their voice will somehow make it easier for the patient to understand. "People talk loud, they just assume they have a hearing problem," Kallmyer said. "It's obviously annoying. They can hear OK. You don't need to scream at them. You don't want to patronize them. The biggest thing I can say is slow it down and give them time to answer." If a conversation topic seems to confuse the person, move on to a different subject. If the person with Alzheimer's says something that's incorrect, resist the urge to correct them. "When you're correcting someone, it agitates them," Kallmyer said. "It's our nature, you want to correct someone when they've got something wrong, but it doesn't matter."